SEM is a form of Internet marketing involving buying traffic through paid search activities.1 This is distinctly different from search engine optimization (SEO), which is the process of earning traffic organically. Take a second and Google the word “hotel”. See all of the advertisements visible above the search results? Those are ads paid for by a business to generate traffic. Search is the most popular medium for locating information. 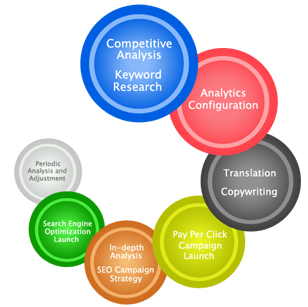 Search Engine Marketing has one of the lowest costs per customer acquisition. Search engine marketing is a very effective way to grow your business and increase profits; it is also the most popular medium for locating information. SEM promotes websites by increasing their visibility in search engine result pages (SERPs) through the use of paid placement, contextual advertising and paid inclusion. With a search engine, advertisers appearing on the top and right hand sides of the first page receive the most click throughs and are a result of SEM. Oftentimes search engine marketing is referred to as CPC (cost-per-click) or PPC (pay-per-click) marketing since most search ads are sold on a CPC or PPC basis.